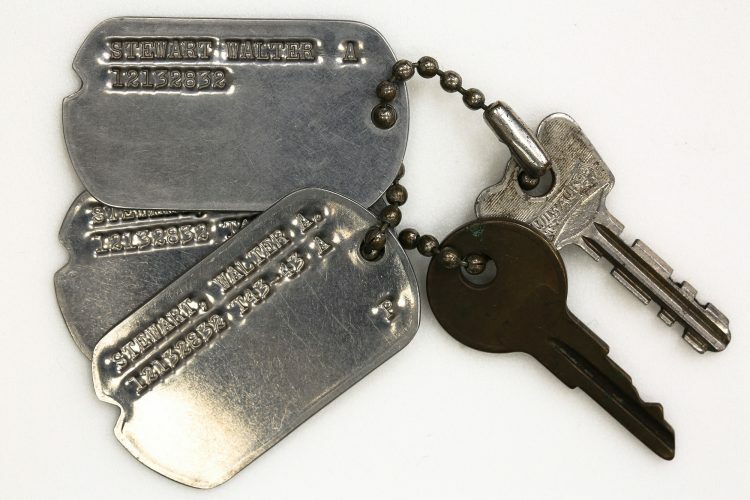 Three dog tags and two keys connected by a short bead chain belonged to Walter A. Stewart. Walter A. Stewart was from New Jersey and entered military service on 2 October 1942. He attended basic training at Camp Luna, New Mexico, and graduated from the U.S. Army Air Force Special Vehicle Operator and Mechanic School at Chanute Field, Illinois. He was assigned to the 27th Ferrying Squadron at New Castle Army Air Base, Delaware, in 1944 and was then transferred overseas until he returned home in 1946.